Last week I posted a photo of Panther Creek, which streams thorough the Gifford Pinchot National Forest just north of Carson, Washington. 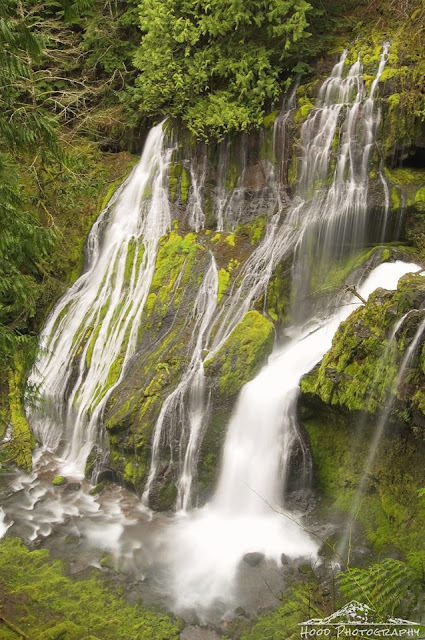 The photo of the creek was taken just upstream from the amazingly breathtaking Panther Creek Falls. The falls are a little known gem in the woods, accessed by a simple drive through the woods and a very short walk down a well maintained, albeit fairly steep trail to a viewing platform. As you can see, there are actually three different waterfalls that drop into the canyon. I was limited on time during this visit, but do plan on going back again soon to hike down to the bottom of the falls for a different vantage point, as it was by far one of the most beautiful places I have visited in recent adventures. We visited these beautiful falls last year. Although the walk is steep it is worth it! Have a blessed Easter. What a gorgeous waterfall Sarah! What a pretty waterfalls! Beautiful photo! Beautiful waterfall! This is one place I need to visit.